All the taste of a loaded baked potato, in a hearty soup. 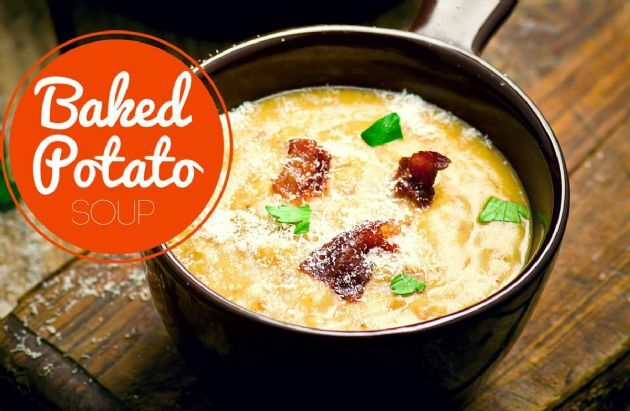 All the taste of a loaded baked potato, in a hearty soup. Place a stock pot over medium heat, then add the butter. When the butter is melted and frothy, add the onions. Cook for two minutes, then add the celery and garlic. Sweat the vegetables for three minutes, then lower heat to medium-low. Stir in the flour. Cook for two minutes, stirring constantly. Slowly whisk in the stock. Add the potatoes then the milk. Cook for about 20 minutes, never allowing the soup to boil, stirring occasionally. Meanwhile, cook the bacon until crisp. Place on a paper towel, blot away any excess grease, then crumble. After 20 minutes remove the soup from heat. If you prefer a smooth soup, use an immersion blender to puree it. Serve immediately, garnishing with the bacon, green onions, and cheese.